Costa Adeje was once an overlooked fishing village filled with the world’s most fascinating beaches. It was only a matter of time before tourists discovered its golden shores and clear blue waters that lead into the Atlantic. With powdery white sand and a year-round climate likened to an endless summer, it is not difficult to see why the southern coast of Tenerife has become a hotspot for posh vacationers and affluent travelers. 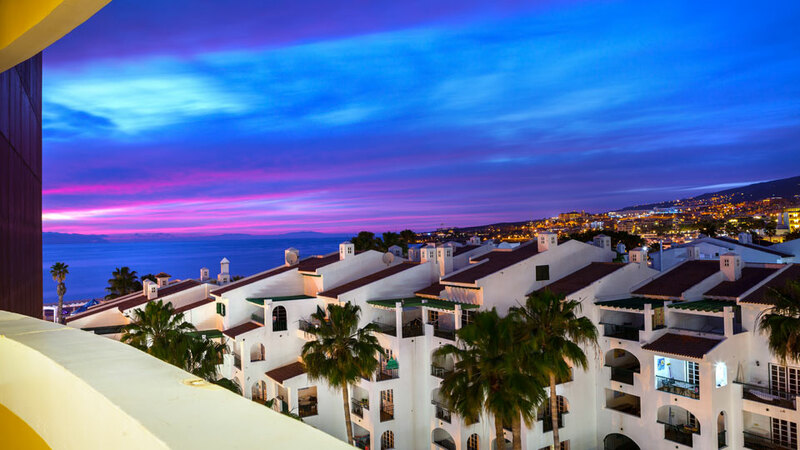 Side by side along its just as desirable neighbors, Los Cristianos and Playa de las Américas, Costa Adeje has quickly risen from its quiet beginnings to one of the most coveted resort destinations in the world. During the Spanish colonization in the 15th century, Adeje was one of the capitals of the many kingdoms of the original Guanche inhabitants on the island. 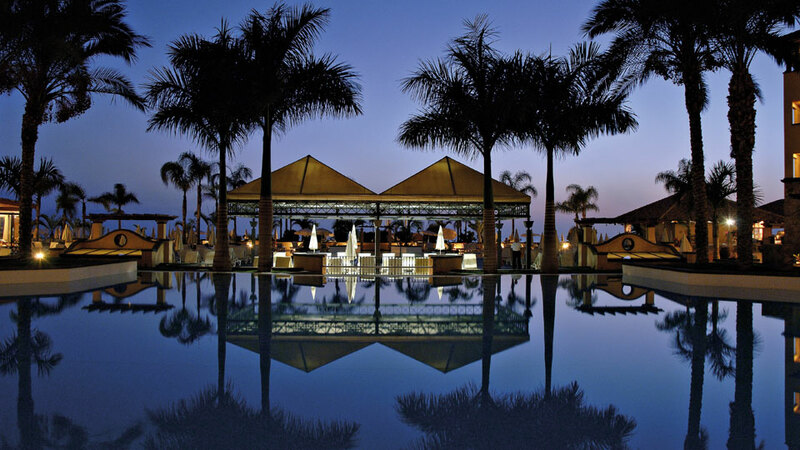 Adeje is the latest addition to the slew of high-class resort areas in Tenerife. Its current developments have come from the recent tourism boom on the island and the need for space to accommodate the growing number of visitors. More than just gorgeous sprawling beaches, Costa Adeje is also home to world-class entertainment and recreation. It houses Siam Park, one of the largest and best water parks in Europe, Golf Costa Adeje, a world-class 18-hole golf course, and many others to keep visitors at the tip of their toes. At night, the town transforms into a reflection of the night sky with its dazzling lights from the luxurious resorts and neon signs. Pitted against the backdrop of Tenerife’s natural beauty, Costa Adeje merges nature and human developments. Despite man-made encroachment, the picturesque town keeps to itself while respecting the environment it shares with the native flora and fauna. Streets are kept spotless and beaches are left crystal clear. In fact, a lot of activities involve spotting Tenerife’s diverse marine life just off the coast of Costa Adeje. Because it is the most recent resort town on the southern coast of Tenerife, Costa Adeje is where the island’s most opulent accommodations could be found. Towering hotels overlooking the Atlantic or the island may come at a price, but that’s why Costa Adeje attracts a certain chic type of tourist. The town is perfect for families, especially those with younger children, while travelers who want to experience the best that their money could offer, will definitely find indulgence in Costa Adeje. Costa Adeje is mostly composed of sprawling beaches with a variety of water conditions, from calm waters to surfable waves. On the other hand, it is also the site of numerous theme parks that will keep the kids and the kids at heart excited. Soak up the sun, play in the sand or engage in a multitude of watersports in a Costa Adeje beach. Sit by the shore and order a cooler from any of the resorts or restaurants nearby and expect excellent service from the line of beaches that merge seamlessly into each other. While many of these coves can be reached by taxi or bus, many opt instead to walk because of the proximity and the scenic views. These 600 to 700 meters stretch of gray gold sand reveals itself in the midst of Costa Adeje’s rocky cove. The beach is owned by the hotel where it is situated but is open to the public. The path leading down to the beach offers scenic views of the cove and the Atlantic Ocean and is filled with strollers and joggers. A bit further below the coast of Adeje is the quaint town of El Puertito. This old fishing village is a far cry from the high-end or touristy spots of the neighboring resort areas. Its main beach, Playa del Puertito, is visited mostly by the locals who enjoy barbecuing and walking their dogs here. Five kilometers from the center of the municipality of Adeje is the coastal town of Fanabe. The town itself exudes a British ambiance with a central plaza surrounded by tea rooms. Upscale villas are a typical site here along with the more lavish and very exclusive resorts along the beach. 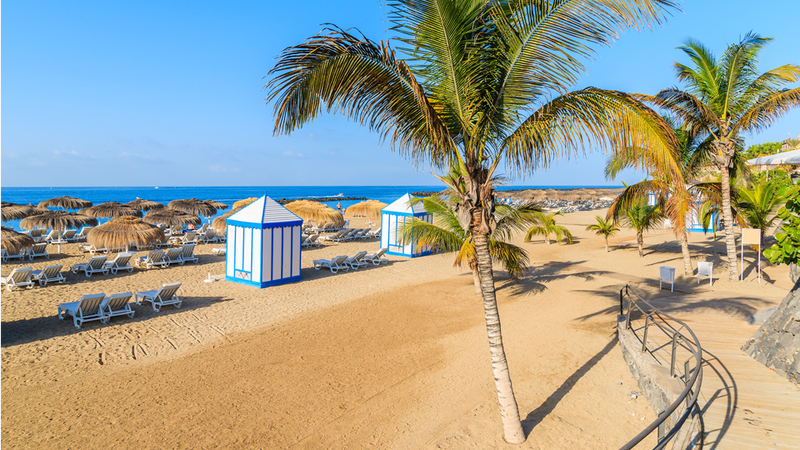 A 200-meter stretch of golden sand, Playa Blanca has become popular for its diving and as a nudist beach in Costa Adeje. The rich marine biodiversity of the waters here attracts a number of visitors as you can find local species of barracuda, rays, sharks and the like swimming nearby. A preferred beach by many visitors in the area because it is so close in proximity to many of the hotels in the area. Playa del Bobo is a man-made cove with black volcanic sand that is best for families and is relatively quieter than the surrounding beaches of Costa Adeje. 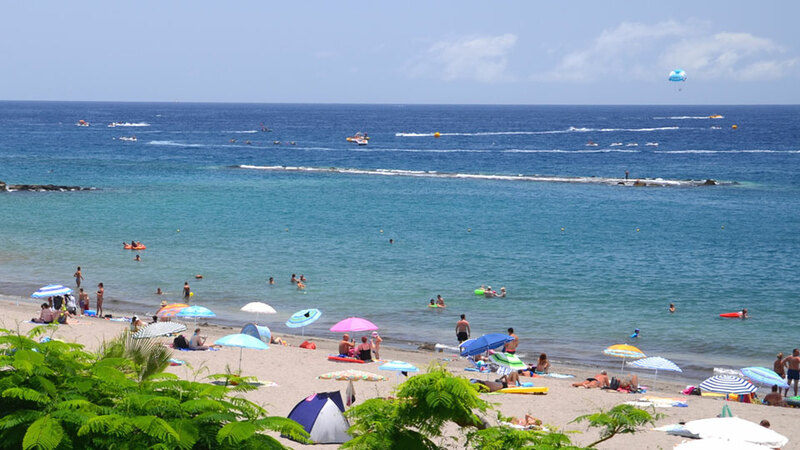 Costa Adeje weather all year round is a perpetual summer ranging from its warmest at an average of 24 degrees Celsius in August (but almost reaching 30 degrees on some days) to its coldest season in the month of January with an average temperature of 18 degrees Celsius. Despite the pleasant weather, the waters off the coast are quite cold since it does open out to the Atlantic Ocean. So, for vacationers, a Costa Adeje beach and its waters are filled with marine life just further offshore and can be ripe for ocean adventures and activities. 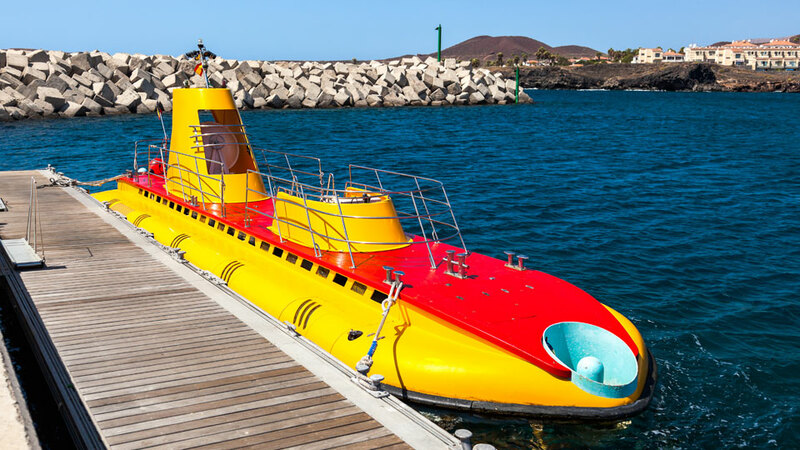 Go 30 meters below the surface of the ocean and discover the underwater world of Costa Adeje. Get to see the diverse marine life representative of the Canary Islands without scuba diving through a state-of-the-art submarine. Hop on a boat on any of the cetacean excursions offered at Puerto Colon and watch gorgeous dolphins and whales swim alongside the boats in their natural habitat. Choose from either the Royal Delfin or Shognun II to embark on your whale and dolphin watching tour. Get to see more off the coast of Adeje and its beaches by charting through its waters. Abrazo Sailing includes a captain that will tour the waters around the island and even take you to unknown beaches for swimming and relaxation without the crowds. Try one of the many jetski tours around the island or just ride it around the sea. If this is not your cup of tea, then Water Sports Tenerife also offers group activities including banana boats, parascending and fly fish. Adrenaline junkies could go for wakeboarding. Costa Adeje’s numerous beaches are a surfer’s paradise. With swells coming from the Atlantic, waves are aplenty. When the wind picks up, opt for windsurfing, and when the waves die down, try Stand-Up Paddleboarding on its clear waters. Costa Adeje caters to all divers from beginners to advanced levels. Numerous dive centers with PADI courses and dive tours around the island’s coast can be found in the municipality. Whether it’s taking the kids to a fun-filled day of water slides and lazy river rides, or just getting them up close and personal with animals, Costa Adeje never seems to run out of entertainment options for the whole family. Even groups of the young-at-heart will find excitement at a water park in Costa Adeje. For those looking to relax and get a game in, Golf Costa Adeje has a stunning view of the sprawling greenery overlooking the ocean. Amidst an exotic Thai backdrop, thrill-seekers will find lots to do at one of Europe’s most reputable water parks. 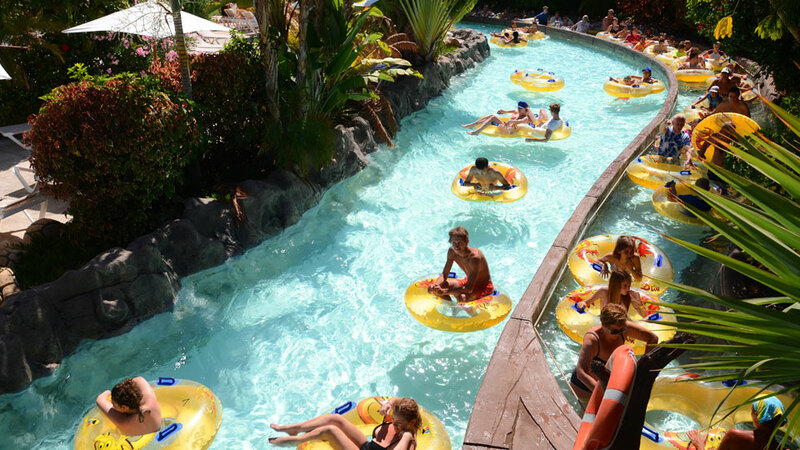 From heart-stopping near-vertical slides to relaxing by the in-house beach, Siam Park has everything for those looking for a full day of fun and R&R. 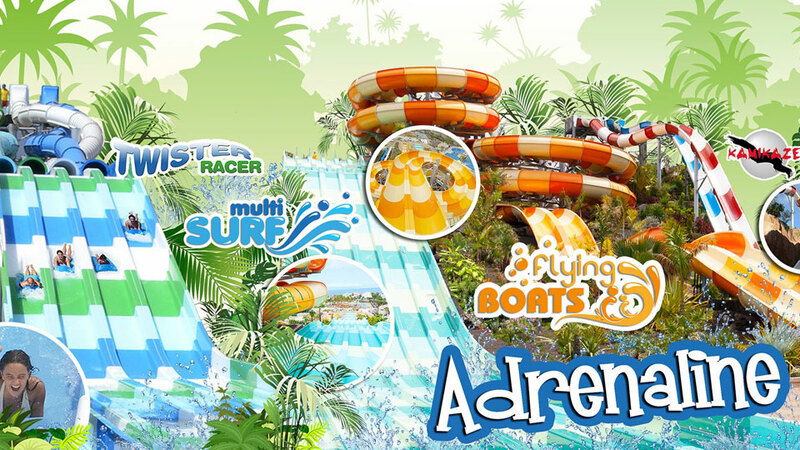 For those traveling with younger kids, Aqualand is a good option for tamer rides. The massive establishment also features a dolphin and whale show where they do numerous tricks in captivity for human entertainment. For the older ones who want to enjoy a warm day of putting and swinging, Costa Adeje is home to one the most majestic golf courses in the world. The 18-hole course presents breathtaking views of the Atlantic and a variety of obstacles over its spanning greenery. Once the sun sets, Costa Adeje’s vibrant coast becomes brighter at night with its slew of bars and pubs. Entertainment options in the area are ripe with live music that ranges from jazz to rock classics in most of the establishments. While Los Cristianos and Playas de Las Americas are known as entertainment central in Tenerife, Costa Adeje’s chic vibe also offers its own brand of amusement. Located at Karting las Americas, Showtime offers a VIP package of unlimited wine, beer or soda with better seats. The show comes with dinner and a full repertoire of the best musicals to hit Broadway. Those looking for a night out filled with entertaining tribute acts from famous musicians of the past (i.e. Tom Jones), St. Eugen’s is the perfect way to end your day. The bar-slash-pub is known not just for their cover bands, but also for their lively ambiance that includes games, a dance floor, and a pool table. For a late afternoon pint or a steady night out, The Pub offers a homey pub feel with live sports for football fanatics. The neighborhood bar is also family-friendly and includes a quiz night on most days with an entertaining host. Get beautiful views of the harbor at sunset from the terrace or indulge in karaoke all night. Moonlight Bar offers well-made cocktails to go with their in-house entertainment of impersonators. Along one of the side streets of Costa Adeje, this unassuming bar serves well-curated cocktails for half the price of the other bars in the area. Despite its small space and hidden location, La Cockteleria is a real gem amidst all the pricey establishments surrounding it. The newest resort complex of Tenerife has become one of the most coveted locations for the holidays or a well-deserved vacation. Chic hotels line the coast that sprawls out to the golden beaches. Whether it’s 5-star or cheap accommodation, the best hotels in Costa Adeje are easily available through online booking and social media. So, the most recent luxury addition to the neighborhood does not go bypassed by potential travelers and vacationers. A major selling point of the hotel for families and couples is its location that is right outside the sandy Playa del Duque. The hotel features amenities as well as numerous pools, gardens, and in-house restaurants, along with spacious rooms with balconies. Perfect for those traveling with younger children, this affordable hotel features family-friendly amenities including kid’s rooms and a kid’s club. Adults, on the other hand, can enjoy lounging in the pool or in their balcony Jacuzzi. Located along the highway, La Tortuga is easily accessible by car or public transport. The staff is accommodating and serves breakfast every morning, while activities and socials are popular at night among backpackers and budget travelers seeking cheap hotels in Costa Adeje. Whether it’s the larger surface area that a villa provides or the affordability that an apartment can offer, more and more tourists are choosing Costa Adeje apartments and Costa Adeje villas for their accommodations. Villas offer a sense of romanticism and privacy that many vacationers will pay a premium for. On the other hand, apartments, serviced or not, may not have the full comforts of a five-star hotel but does have the charm of a home away from home, especially when stretching a budget. Set away from the tourist center, getting to this exclusive resort requires a private car because of its location. Overlooking the verdant vastness of the Costa Adeje golf course, this resort features 29 fully furnished villas with their own pools, along with numerous amenities on-site including a restaurant. 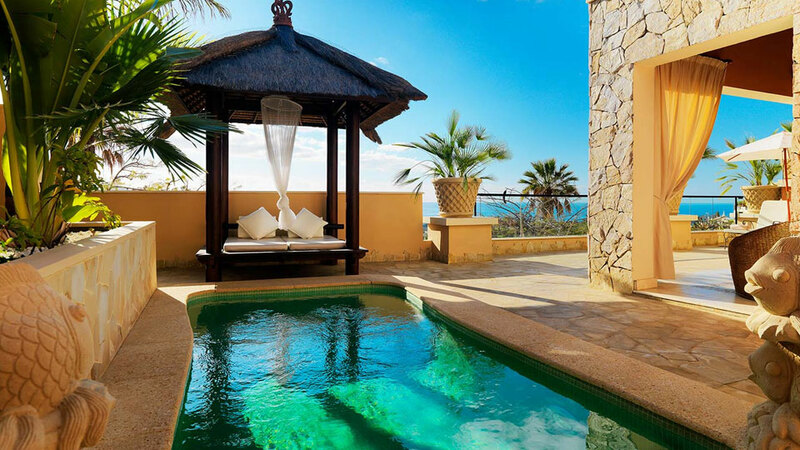 Just 10 minutes away from Playa del Duque, this high-end hotel offers more spacious rooms in their suites, thus considered by many as luxury serviced apartments. Suites come with either a pool or a Jacuzzi and are contemporarily furnished with arresting views of Costa Adeje. This homey two-phase apartment complex includes a convenient parking space per unit and a pool for the tenants’ use. Only a few minutes downhill walk to the beach, the apartment is a short taxi ride to the bars and restaurants of the tourist center. 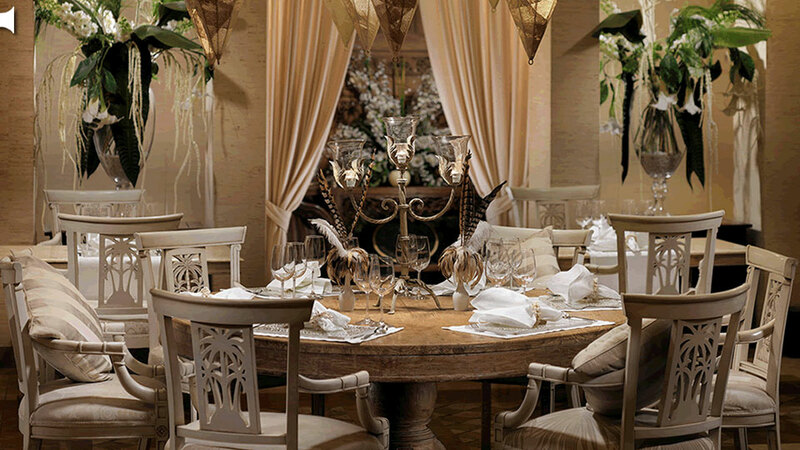 A hodgepodge of cultures compressed in one upscale territory is sure to elicit some great dining finds. With cuisine options that range from fine dining Italian to budget tapas, Costa Adeje’s dining landscape has all types of food to cater to even the pickiest eater. Quintessential British pubs line many of the streets but a few niches here and there will reveal authentic Spanish and Canarian cuisine. Situated in the swanky Royal Garden Villas Hotel overlooking Golf Costa Adeje, this restaurant is one of the most romantic in the area for its unique décor and optional al fresco dining experience. If you’re into fine dining and beautiful plating, dress smart because this is the place for you. A family-owned Italian restaurant situated by the beach, you can expect gorgeous views of the sunset while sipping good wine. The food here is all homemade and may take a while considering each dish is made from scratch. Prices are of great value as well for the quality of the food and portions. Filled with large portions of mostly American cuisine and its cultural combinations (think burgers and fajitas in one menu), Harley’s is perfect for the whole family. The kids will love the fried comfort food and American-inspired memorabilia while the adults can have their fun at the bar along with the night’s roster of entertainment. Located at the Fanabe Plaza Shopping Center, this vegan joint is top notch as it changes its menu based on the seasonality of local ingredients so you know you’re always eating fresh. The restaurant also has a bakery that creates gluten-free cakes and desserts to cap off a healthy meal. From the South airport, getting to Costa Adeje requires you to pass the TF-1 motorway. If you’re commuting, a taxi or bus to Costa Adeje will take 25 minutes. 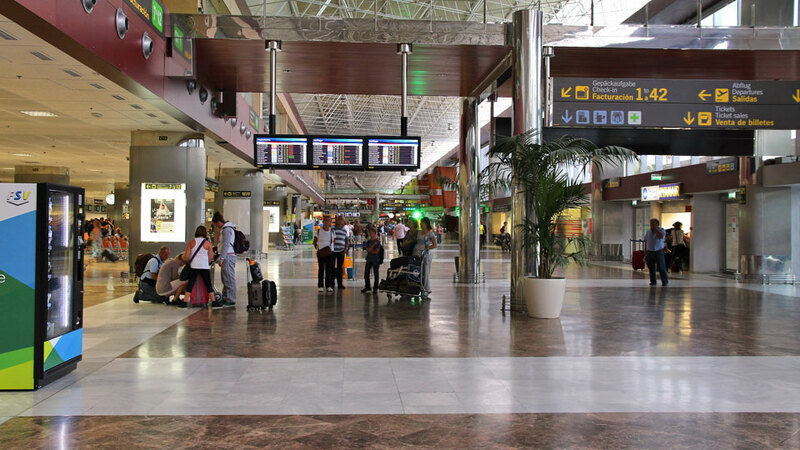 Take the TITSA 110 or 111 buses from the airport to the Estacion or Costa Adeje bus station. Getting around Costa Adeje is fairly simple since most of the tourist centers are accessible by walking. However, tourists could opt to take the buses that pass through Costa Adeje as they normally stop in each town. Buses 418 and 420 passes through Costa Adeje until Los Cristianos, then traveling north to its final destination at Valle San Lorenzo. As the newest resort town, the older locations of Los Cristianos and Las Americas seem weathered when compared to the modern hotels and entertainment options that Costa Adeje has to offer. Despite the heavy tourism, the territory features true hidden gems and must-visit experiences. Costa Adeje has proven that it is more than just frolic and sun but can be a learning ground as well as an opportunity to experience some of the luxuries life has to offer, whether it’s sleeping on Egyptian cotton sheets or a thrilling water slide like no other. In the end, it is these tourist-driven attractions and establishments that fuel Costa Adeje, and what brought it from a sleepy fishing town to one of the hottest vacation destinations in the world.